Texas Hold'em is by far the most popular form of poker. It's an important part of modern history and culture. It's a great game for serious and recreational players alike. According to the old adage "Texas Hold'em takes just a few minutes to learn but an entire lifetime to master", and in this article, we'll explain the rules of the game so you can take the first step on the way to the aforementioned mastery. 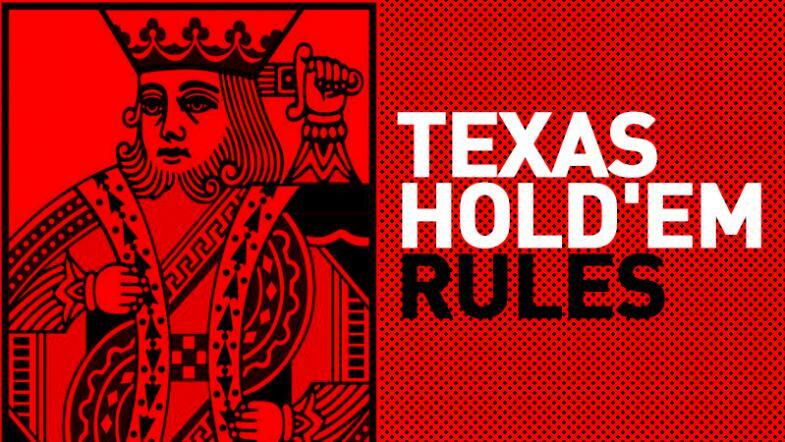 As we've already mentioned, the rules of Texas Hold'em aren't very complicated. There's a good chance you've already seen the game played on your TV screen or in your local casino. Maybe you played the game with your friends in the past and you're in need of a quick refresher? If that's the case here's a basic overview of how the game is played. Texas Hold'em is a game that can be played by 2-10 (more commonly 9) people at a single table. 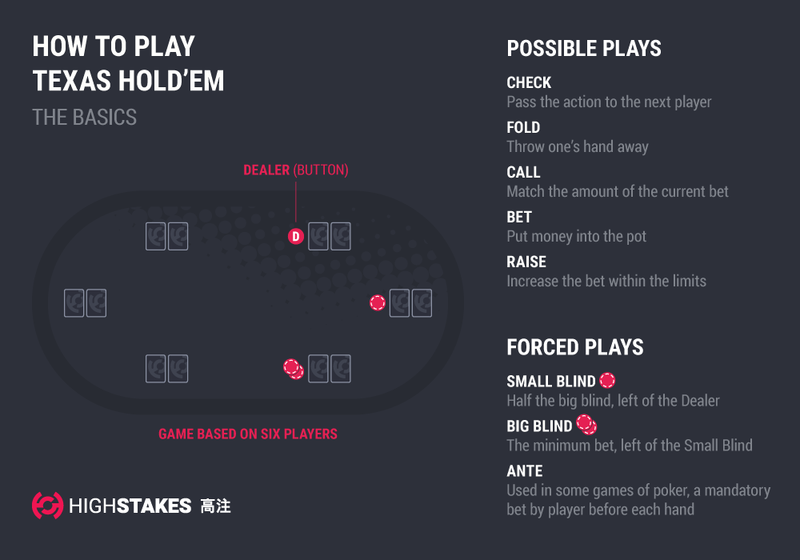 Each hand starts with two players posting so-called "blind bets" or simply "blinds" - small mandatory bets that ensure there's some amount of chips to play for before the first betting round opens. After that, every player is dealt two cards, commonly referred to as "hole cards", and the first round of betting begins. The action goes round the table clockwise, and once the betting round is over, the first three community cards are dealt face up on the table for everyone to see - this step is called the Flop. Each player can use the community cards to complete their five card poker hand. After the Flop betting round is over, we get two additional steps called Turn and River, that work just like the Flop except only one additional community card is dealt instead of three. If there are still two or more players left in the hand after the River betting round is over we proceeded to the Showdown step where players remaining in the game reveal their hole cards, and the one with the best hand wins the pot. Now that we know the basics let's talk some details starting with the hand rankings. A Texas Hold'em hand always consists of 5 cards. You can use any number of your hole cards and community cards to construct your hand. For example: if you're holding J T on a J T 2 6 A board your hand is J J T T A (two pairs, jacks and tens with an ace kicker). If you're holding A 7 on an A A A K 2 board your 5-card poker hand would be A A A A K (Four-of-a-kind Aces with the King kicker) given how the 7 in your hand is a weaker card than the King that was dealt on the turn. Sometimes you won't be able to use any of your hole cards like when you're dealt 22 on a Q J T 8 9 board, given that the community cards alone form a straight that the cards in your hand can't improve. Royal Flush. Example: A K Q J T The strongest hand in poker that consists of the five highest cards, all of the same suit. Straight Flush. Example: 8 7 6 5 4 The second strongest hand in poker. Five consecutive cards of the same suit. If two players have a straight flush the one with the highest card wins. Four-of-a-kind. Example: J J J J Q Another hand in the Hold'em hierarchy that consists of the four cards of the same value and a fifth card called "the kicker". The higher the four cards the stronger the hand. In case two or more players have the same four-of-a-kind (which happens when there are four cards of the same value among the community cards) the higher kicker card wins. Full House. Example: 7 7 7 3 3 A hand that consists of a three-of-a-kind and a pair. If two or more players have a full house the one with the higher three cards wins. If they all have a hand with the same three cards, then the value of the pair decides the winner. Flush. Example: K J 8 5 2 Five cards of the same suit in no particular order. If two or more players have a flush the one with the highest card wins. Straight. Example: Q J T 9 8 Five consecutive cards. Again, if two or more players have a straight the one with higher cards wins. Three-of-a-kind. Example: 9 9 9 2 4 Three cards of the same value and two other cards. Given that poker hand always consists of 5 cards in case two or more players have the same three of a kind the value of two other cards decides the winner. Two-pair. Example: A A K K 8 Two different pairs and a kicker card. If two or more players hold two pairs the higher pair decides the winner, and when players have the same two pair hands than the highest kicker card wins. Pair. Example: Q Q J 9 5 Two cards of the same value and three kicker cards. High card. Example: A K J 3 5 If you didn't manage to at least pair any of your cards than the value of the highest card among the hole cards and community cards decide the strength of your hand. Like we've already mentioned, before the cards are dealt, two players sitting behind the dealer button (a marker that travels around the table in a clockwise manner that dictates which players have to post blinds and from which seat the dealer starts dealing cards - hence the name of the prop) are forced to pay the small blind and the big blind. The big blind is usually double the small blind value. These small bets ensure that there're some chips to play for no matter what cards players end up receiving, which makes the subsequent betting rounds a lot more interesting. Without the blinds, there would be no incentive for players to engage in betting if they didn't receive the best possible hole cards. When it comes to betting rounds, there are a few actions you can take. First of all, you can simply decide to Fold your hand if you deem it too weak to continue playing with. If there were no bets placed before it's your turn to act (keep in mind that blinds count as bets!) you can simply Check and continue playing the hand without investing additional chips into the pot. If there was a bet placed before you, you can continue in the hand by matching its amount (which is referred to as Calling) or by making another bet that's at least twice the value of the bet placed before you (commonly referred to as Raising). After each Raise, players that already invested some chips into the pot gain the opportunity to Fold, Call or Raise again and once there's no more raising to be had ( the player that was last to act during particular betting round decided to Fold or Call) another round of betting begins. As far as how much you're allowed to bet, that depends on the game format. Texas Hold'em can be played in a Limit or Pot Limit betting structure and both of them enforce arbitrary limits on the portion of your stack that you're allowed to risk at any given moment, but in No-Limit Texas Hold'em - which is by far the most popular poker variant - there are no such limitations. This, however, doesn't mean that you should bet your entire stack often. A sensible Pre-flop raise will be somewhere in the neighborhood of three big blinds, and your bets on the Flop, Turn and River should usually equal around 50-100% of the size of the pot. Picking the optimal bet size for the situation is one of those aspects of the game that makes it so fun to play and so challenging to master. You start the hand in the dealer position. Two players sitting on your left post the small and the big blind. You're dealt A J . The first betting round opens, the action goes around the table starting with the player sitting right after the big blind position. Everyone folds and it's your turn to act. You decide to put in a raise equal to three big blinds. The small blind folds. The player in the big blind calls adding two additional big blinds to the one that he already committed to the pot. The first betting round ends and the Flop comes A 8 3 . The big blind is now first to act and he starts the second round of betting with a Check. You decide that your hand is strong enough to Bet and so you Bet 5 big blinds into a 6,5 big blind pot. The player in the big blind position Calls and the second round of betting ends. The Turn comes 5 . The player in the big blind position Checks again and this time you decide to also Check. The third round of betting ends and the River card is dealt. Now there's A 8 3 5 A on the board which combined with your A J hole cards gives you three-of-a-kind with J 8 kickers A A A J 8 . Your opponent is first to act and he bets 12 big blinds. You decide to put in a small raise of around 28 big blinds sending the action back to your opponent who folds and the hand ends. If your opponent decided to make a call instead, there would be a Showdown step where you'd compare the strength of your hands and the player with the better holding would've won the pot. Now that you know the rules of Texas Hold'em, you're ready to try your skill and luck at the tables. Remember that the path to becoming a good poker player is a long one, play responsibly and enjoy the game!